Rhoda’s Market Agency scoops up the Inaugural APAC Recognition and Acknowledgement Award 2012 in the category: Small Market Agency. The Annual PMA Conference held at the University of Pretoria on the 22nd of August 2012, in Tshwane, hosted the fresh produce industry regulatory body’s, APAC, first award recognition ceremony. Agricultural Produce Agents Council (APAC) has played as important role in agriculture since 1993 when it was instituted by law to regulate the occupations of fresh produce and livestock agents, as from 2003. This has been done by formulating policy, applying the rules, monitoring and enforcing a code of conduct. Mr Uthmaan Rhoda (RMA) was the proud recipient of the award, which included a certificate and cash prize by APAC, as well as a laptop sponsored by Freshmark Systems of East London. Although Mr Rhoda has an extensive history of fresh produce trading, Rhoda’s Market Agency has operated in the precincts of Cape Town market since 2003. In a recent Interview with Mr Rhoda, we asked what this award means to him and the industry on the whole. “The award comes at a time when one questions one’s place in the industry, and when a PDI agencies’ breakeven is at a knife edge, as one has the infrastructure to double in volume of produce turnover. So I see this award as a key to unlock opportunities that present itself within the industry, and the challenge is now at my door to realize the potential that the Agency has. It is refreshing to see that if one stands by ones principles and beliefs, you can reap the fruits of ones labour, and therefore I thank APAC” Mr Rhoda said. Mr Rhoda had persevered, although many doors had shut in his face, in his quest to convince producers and service providers to give him the opportunity to prove that RMA is a real Market Agency that will live up to their expectations. In his thanks, Mr Rhoda highlighted that the City of Cape Town initiated the PDI program, and now Cape Town Market, has taken the baton and continued their support of these Agencies. Cape Town Market Buyers, big and small, are a vital ingredient in the recipe that makes the market the vibrant, hustle and bustle success it is. The Cape Town Market is always looking at ways to improve the buying experience such as launching a dedicated buyers card centre where buyers are able to register quickly and easily and receive a personalised buyers card. The Cape Town Market has also updated the signage on the market to ensure that buyers know exactly where to go and how to find everything they are looking for. And now a buyers care program has been launched that introduces buyers, new and old to the world of fresh produce markets. The Buyers Care Program, launched on Wednesday (5th September 2012) incorporates a new and fresh experience, timed perfectly for the start of spring, a time for all things new. All buyers, new and old, will be presented with a buyers pack that is full of useful information and a complimentary lanyard to hold their buyers card. The pack contains information such as how to register, who the agents are and how to contact them, how the market works, how prices are determined, our covenant to our buyers and producers and a map of the market. To mark the launch of our Buyers Care Program we have developed a slogan that captures the heart and soul of the market and the vibrant array of buyers, the buyer slogan is “Smaak’it at the Market” and along with branded merchandise that will be part of a lucky draw we have invited all our buyers, new and old, to be part of the launch. Every member of the Cape Town Market staff, from the newest seedling right up to the CEO, is part of the launch and will be part of the various teams present from 5:00am to 10:00am everyday during the launch. The Cape Town Market is a family of fresh produce people and our buyers, as well as our agents and producers, are all part of this family. Our philosophy is simple, “Fresh Thinking, Fresh Produce, Fresh Approach”. To all our buyers, welcome to the family. On Sunday, the 30th September 2012, the Cape Town Market participated in the annual Gandhi Peace walk. 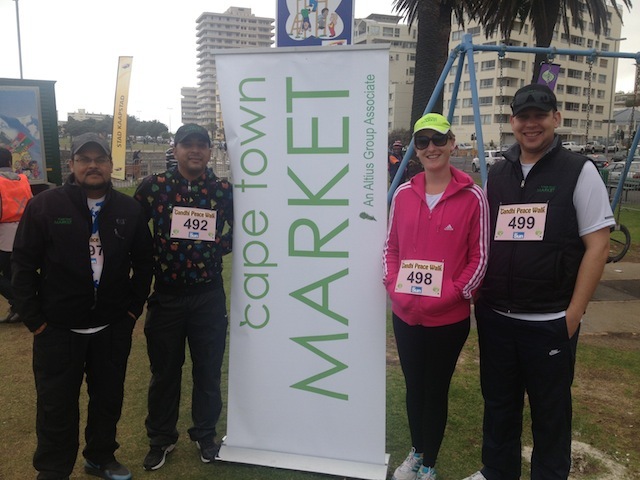 As well as assisting with sponsorship for the event, the team from the Cape Town Market was present to participate in the walk in the quest for universal peach an d health. All proceeds raised were donated. The walk was split into two distances, a 5 km and a 10 km and took place along the Sea Point promendade.